You are a system integrator or machine builder and want to provide the best level of service and support to your customer. Remote access during the commissioning phase can save on travel expenses when a small program modification is needed, likewise after the installation & commissioning is complete and the system is “running” or the machine is in production you now want to have an easy solution to meet your support obligations. Having access to the PLC and HMI from your office, just as if the hardware was next to you will allow easy diagnosis of both the PLC and the HMI – using the proprietary programming software of the PLC and HMI maker. You are a machine provider or system integrator that needs to provide your customer with access to an operator panel of a machine in order to operate or monitor it. The device may be a PLC, HMI or PC that has a SCADA type Web virtualization interface, or it may require access to a PC desktop to access the information GUI. Install a SiteManager at the machine location, or install a Software SiteManager on a Windows based device at the location. SiteManager gets access to the central GateManager M2M sever via the local network or via 3G. 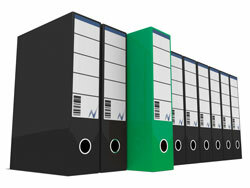 Create and administer user accounts for users via the GateManager Web portal. 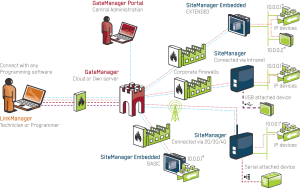 Engineer receives a link to the M2M GateManager, which provides him with the LinkManager Mobile interface in his web browser. The engineer starts LinkManager Mobile and establishes a connection to a device. Start a web browser or Remote Desktop app and get redirected to the device automatically. You are a machine provider that wants to offer preventive and predictive maintenance services for your machines by monitoring and logging machine information to a central surveillance centre. You want to be independent of remote networks as this is out of your control. If an issue occurs, you wish to be able to connect to the equipment for further diagnostics, programming and upgrades. 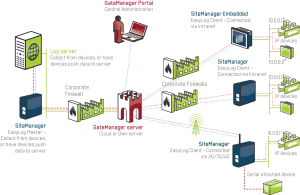 Install a GateManager M2M server at yoursurveillance centre. Install SiteManagers at the machine locations or install a Software SiteManager on a Windows based device at the location. 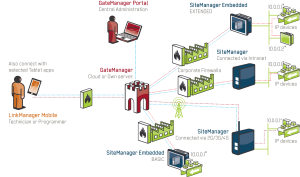 SiteManagers connect to a central GateManager M2M server via the local network or via 3G. Connect your data logging server locally to the GateManager and connect to all remote devices simultaneously via the Device Relays. For further analysis manually connect to the device with the LinkManager client and perform diagnostics, programming and upgrades.